Prime Minister Allen Chastanet has described 2019 Commonwealth Youth Awardee, Johanan Dujon,as an inspiring story for all Saint Lucian people. “We are elated and so proud with the recent news that our own Mr. Dujon was awarded the Commonwealth Youth Award for 2019 in London,”Chastanet wrote on his official Facebook page. “We recognize the positive and active role and contributions of young people in promoting development, peace, democracy and in protecting and promoting other Commonwealth values, such as tolerance and understanding, including respect for other cultures,”he observed. 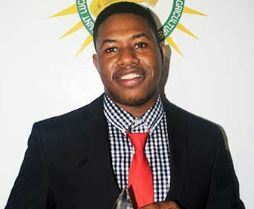 Johanan Dujon, owner of Algas Organics, was among four young entrepreneurs, and the only Caribbean National, who obtained the coveted 2019 Commonwealth Youth Award on March 13th, 2019. Dujon’s company converts Sargassum seaweed into bio-fertilizers and household chemicals, abating the detrimental effect of the seaweed’s hydrogen sulphide emissions. The products are sold to commercial farmers and households. He won in the category: Industry, Innovation and Infrastructure, meeting Sustainable Development Goal No. 9 (SDG 9). Very Inspiring. For to long, all we hear are the negative things our young people do.